Welcome to the home of The Ka‘ū Calendar. Here you will find the latest news of Ka‘ū as well as dates and times of local events such as concerts, classes, exhibits and meetings. Read the current edition of The Ka‘ū Calendar and the entire collection of The Ka‘ū Calendar's back issues since its first publication in November 2002. 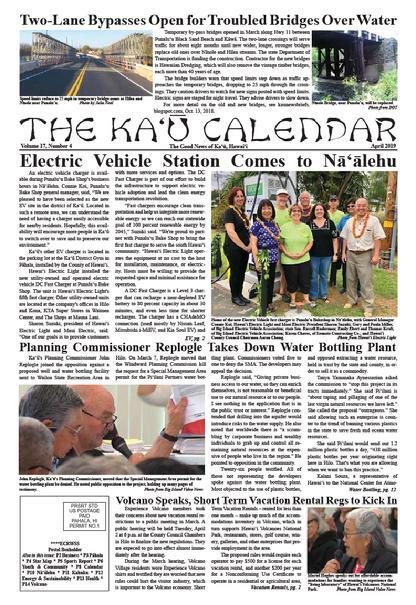 The Ka‘ū Calendar Newspaper Online. Update the calendar with your event by emailing geneveve.fyvie@gmail.com or calling 319-9035. Advertise in The Ka‘ū Calendar and support local news! Reach all of Ka‘ū in just 12 ads a year! See your ad mailed to all U.S. Postal Boxes in Ka‘ū - over 4,300 boxes - and put on stands from Volcano to Miloli‘i for a total of 7500 copies a month. Don't forget your ad goes online too! Download our rate sheet here and sign up today(printable)! Click here for fillable advertising contract. For daily news updates, visit our blog at kaunewsbriefs.blogspot.com. Check our daily posts to Facebook at facebook.com/kaucalendar. To order newspaper delivery beyond Miloli'i to Volcano Village, email your full name and mailing details to mahalo@aloha.net and send a check made out to Local Productions, LLC, once a quote has been emailed to you, or call 928-6471 with details and a credit card ready. For news coverage requests, email mahalo@aloha.net or call 928-6471.